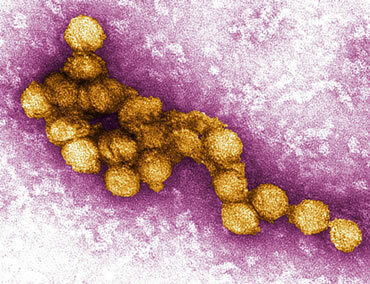 West nile virus (WNV) is a neurotropic, arthropod-borne virus (arbovirus), within the family Flaviviridae. Flaviviridae are distributed worldwide, consisting of about 75 species in 9 serogroups, many members of which cause disease in humans and animals. Other important human Flaviviridae pathogens include yellow fever, dengue, Zika, chikungunya, St. Louis encephalitis, Japanese encephalitis, Murray Valley encephalitis, tick-borne encephalitis, Kyasanur Forest disease, and Omsk hemorrhagic fever viruses. The WNVs are spherical particles with a membrane envelope and dense core. Replication is not fully understood. The virus is deposited by mosquito into the skin where it contacts Langerhans cells, whose job is to acquire antigens and transport them to lymph nodes. Langerhans cells present the WNV antigens to T-lymphocytes. The initial replication of WNV is believed to take place in the regional lymph nodes. "WNV then spreads systemically to visceral organs, such as the kidney and spleen, where a second round of replication takes place, presumably in epithelium cells and macrophages, respectively (Rios 2006). The typical incubation period is usually 2 to 6 days but ranges from 2 to 14 days. This period can be longer in people with certain medical conditions that affect the immune system. West Nile viral disease is a nationally notifiable arthropod-borne virus (arboviral) disease. Cases are reported to ArboNET. by state and local health departments. ArboNet. maintains data on arthropod-borne virus infections among blood donors, veterinary disease cases, mosquitoes, dead birds, and sentinel animals. "Approximately 85% of arboviral disease cases occurred during April–September. Weather, zoonotic host and vector abundance, and human behavior are all factors that can influence when and where outbreaks occur (MMWR)." The Flaviridae family of viruses is responsible for a number of highly pathogenic diseases in humans.